Yolande Unternahrer was born in Paris, France, in 1911. Her father, Jacob Unternahrer, was a businessman, moved the family to London and Yolande was educated at Hampstead Heath. She also spent time in Switzerland, and by the time she finished her education could speak English, French and German fluently. On the outbreak of the Second World War she joined the Women's Auxiliary Air Force (WAAF) where she trained as a wireless operator. She worked at several Royal Air Force fighter command stations, before joining the Special Operations Executive (SOE) in February 1943. In August 1943 she married Jaap Beekman, a sergeant in the Dutch Army. The following month, on 18th September, she was landed in Tours and went to work as a radio operator for Gustave Bieler, the head of the Musician Network at St. Quentin. In January 1944, Yolande and Bieler were arrested while together at the Café Moulin Brulé. Bieler was shot soon after by the Schutz Staffeinel (SS) at Fossenburg. 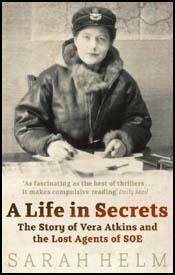 Yolande was interrogated by the Gestapo before being transferred to Fresnes Prison. On 13th May 1944 the Germans transported Yolande and seven other SOE agents, Eliane Plewman, Madeleine Damerment, Odette Sansom, Diana Rowden, Vera Leigh, Andrée Borrel and Sonya Olschanezky to Nazi Germany. Yolande Beekman was executed at Dachau in September, 1944.
with London, and St. Quentin seemed likely to develop into a key town for German railway and canal communications. The next thing to decide was the composition of the team. Bieler had such an outstanding personality that it was difficult to find a suitable partner for him. After a good deal of thought, we decided on Yolande, a girl of Swiss extraction sent to us by the W.A.A.F. Her French was perfect - the touch of Swiss accent was a positive advantage, as it diverted attention from her rather typically English appearance. She was very quiet and homely - she had gained immense popularity at the wireless school by taking over unofficially the duties of darner of socks for the men-and her unruffled cheerfulness and good humour were a great asset. She quickly developed an easy camaraderie with Bieler which promised well for their future work. Bieler had towards all the women engaged in our work a kind of amused tolerance which some might have faintly resented. But Yolande took his attitude without offence, and her very unaffectedness and simplicity evoked his esteem and admiration. (3) On 13th May 1944, Odette Sansom was moved by the Gestapo from France to Germany with Yolande Beekman, Vera Leigh, Madeleine Damerment, Elaine Flewman, Diana Rowden, Andrée Borrel and Sonya Olschanezky. She was interviewed about these experiences by Rita Kramer for her book Flames in the Field. Everybody tried to be a little braver than they felt. All of us had a moment of weakness, we did all cry together at one moment, there were a few tears, but after all it was a lovely spring day in Paris. Riding in the van from the Avenue Foch to the station we could get a glimpse of what was going on in Paris, people sitting on the terraces of cafes drinking their ersatz coffee or whatever. I was looking forward to the trip. I had spent a year alone in my cell and I thought. Now I am going to be with these other women.